::ASN-News |:::Islamic Information Portal:::| 2002-2005 | News, Photos, Execluzive|. Blast in Tel-Aviv. 2 kill & 42 injured. Labor day celebrations in Russia. 2 Militants detained in Dagestan. 28 People die in mine tragedy in Russia. Russian President: Chief Mufti for All Muslims in Russia. The American understood the Islam in Tatarstan. In Cairo has passed demonstration to support of the Chechen Republic. Fire in Frienship University, has killed 37 people. Correspondent "Los Angeles Times" has die in Baghdada, Official. Within a few years a Christian crusade against Islam will be launched.Islam will disappear. Baghdad residents protest against US occupational politics. Manama, Bahrain (Service of Information "ASN-News", photo:АР), |20:10, on April, 04 2004 |. 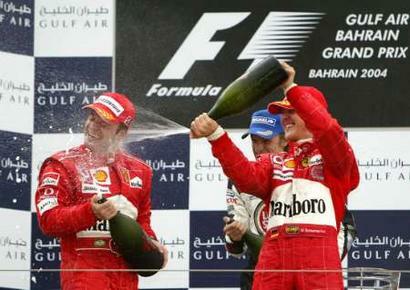 Michael Schumacher has won Sunday on the first Arabian Grand prix of the Formula-1. As informs a telechannel ARABIA TV, Michael became the first on a final part of Grand prix of Bahrain, it has passed a line (57 circles) the general long 308.679км, for 1 hour and 29 minutes. The second place was borrowed with his partner on a command, Brazilian Ruben Barikello. And the third place on предестале has borrowed Djanson Batton (BAR). Cups, and заместо champagne, citric lemonade have been handed winners. Also in a role there were girls not to open clothes, and in closed. Is in a scarf and a long dress. Earlier "ASN-News" informed that Heads of 5 Arabian states have arrived specially to Bahrain what to look race of the Formula - 1, Grand prix of Bahrain which will pass today to the east of capital of Bahrain, the cities of Manamas on special line "Sakir". As informs telechannel ARABIA TV, at present in Manama there is a King of Jordan, Abdallah the second, and also crown prince of Qatar, sheikh Tamim bin al-hamd al-sani, and also crown prince of United Arab Emirates, sheikh Mohammed bin Zayyed. And also the president of Yemen, Ali Abdallah Salih. Also on race there will be a president of Mauritania. From the European leaders it is possible to note, king of Spain, Huan Carlos and crown prince of Monaco, Albert. Race of the Formula - 1 for the first time passes in the Arabian country. BACK TO MAIN PAGE - BACK TO RUSSIAN VERSION OF ASN-NEWS. Assalamu Aleikum! The ASN-news, News Islamic Service has published the about Us HERE, Is feedback please send HERE. For more population , has been detected SEARCH ARTICLES SERVICES, Is HERE. The more adres: 1193 Kurniche Al Nil street, Town Cairo. Mobil number: (+02)0127940154(Igor Segodniy). ASN-News. The liberty Islamic Mass-Media Portal. Project Mr.Damir Ahmed. The all materials has published in this portal, right reserved to all muslims in world, only the hyberlink on the Index Page. The site bulding in 21 August 2002, english version opened in 06 december 2002. ASN 2002-2004. The chief of this version: Umar.